Razer unveiled its very own virtual reality head mounted display during CES earlier this year, and now the first update is on its way. 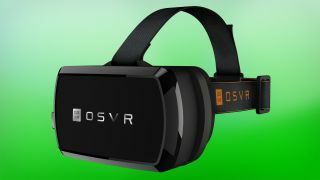 The OSVR Hacker Development Kit v1.1 will say goodbye to the IPS panel and now boast a full HD OLED display for lower latency and higher contrast. The optical mechanics have also been improved for easier adjustments which is a relief since the first kit didn't work as well as the Samsung Gear VR's diopter. New faceplates are now an option as well for the hacker dev kit. Whether it's for branding customization or for functional purposes - like utilizing modules for positional tracking - will be up to you, if you plan on using Razer's tech to develop your own VR headset. There are even designs you can download straight from Razer's site including an IR-LED faceplate module which can be used with an infrared camera to enable positional tracking using pattern detection. The other is a dual-camera faceplate module which has an dual-camera system to enable positional tracking and augmented reality applications. Razer's Chris Mitchell also told us that the price for the OSVR HDK will remain the same at $199 (about £130,AU$246) and should start shipping in June 2015. The hardware might even be updated again before it ships out. Though still in the alpha stage, the Open Source Virtual Reality platform has been upgraded as well. There's now an Unreal Engine 4 plugin, imager interface to allow video streams such as those from color cameras, IR cameras and depth sensors to allow functions such as positional tracking, eye tracking, SLAM, face recognition and augmented reality. Also included in the update, a distortionizer tool that allows estimating the optical and chromatic distortion of HMDs and a shader that uses the measured parameters to correct such distortion. Ubisoft has thrown its hat into the ring and joined the OSVR platform, as well as Vuzix, Stompz, Seven Hills Games, Seebright, Inc., Aesthetic Interactive, ARCortex, castAR, Godhead VR, Homido, Hydra Interactive Entertainment, Mindfield Games Ltd.